Russian President Vladimir Putin will meet with secretary general of the Council of Europe Thorbjorn Jagland on Monday, the Kremlin reported. 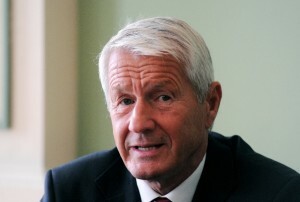 Jagland arrived in Russia on a three-day working visit on Sunday. The visit’s programme will start Monday when the Council of Europe chief meets with Russian foreign minister Sergei Lavrov in the Black Sea resort of Sochi. The Russian foreign ministry reported that the sides plan to discuss the progress of the Council’s reform started a few years ago. Russia joined the Council in 1996 and is one of the five main contributors to its budget. On Tuesday, Jagland is to meet with representatives of Russian NGOs and speak at a joint meeting of the committees on international affairs and on constitutional legislation and state construction in the Russian lower house, the State Duma. He will also meet with Duma speaker Sergei Naryshkin.